You are invited to Port of Portland’s opening of The New Corkscrew observatory on Sunday 2nd Dec 2018. Commencing at 10-30 am. 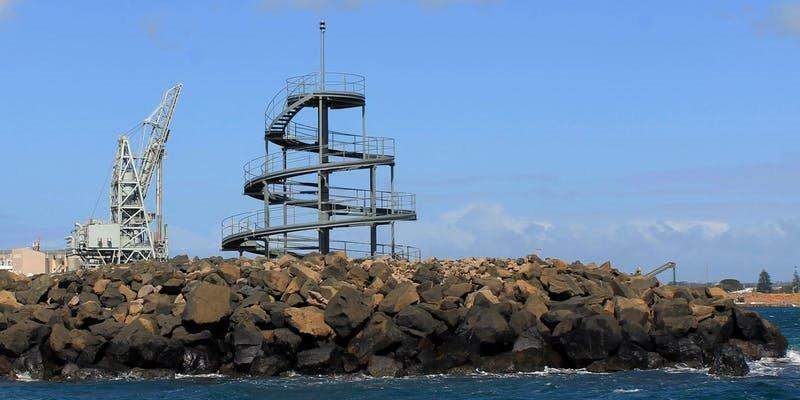 Buses will be available for boarding at the Portland Visitor Information Centre Lee Breakwater Road Portland and will travel through the Port precinct prior to disembarking at the Smelter Berth where a short walk of approximately 400 metres is required to access the corkscrew. You must book a seat on the bus to gain entry to the corkscrew. The corkscrew was constructed on the main breakwater of the Port of Portland in around 1960. The structure was erected in a show of goodwill from the port developers to the port and townspeople of Portland. The corkscrew was designed by Godfrey & Spowers, Hughes, Mewton and Lobb and had a unique corkscrew shape, over a continuous graduation providing three viewing platforms. 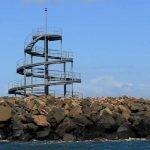 The corkscrew was originally designed to be a landmark, as well as a beacon at the end of the main breakwater. Today’s corkscrew has been constructed by local engineering firm Fechner Engineering and is constructed predominantly of steel making it suitable for the harsh marine environment. These materials will stand the test of time and the corkscrew will continue to be an iconic landmark for Portland and its community. Security at the Port of Portland is governed by the Maritime Transport and Offshore Facilities Security Act 2003. The Port of Portland has an approved Maritime security Plan which covers security based risks at the Port and the local community. Access to the Port security zone is permitted to authorised permit/ticket holders only. Port of Portland is required to maintain a register of all visitors. As you are entering a Port security zone, you will be required to provide your full name and show photo ID ( adults only) prior to boarding each bus. Children under the age of 4 are not permitted to climb the corkscrew. Children between the ages of 5 to 12 must be accompanied by an adult when climbing the corkscrew. Busws will leave the Portland Visitor Information Centre every 20 minutes commencing from 10-30 am. Telephone the Port of Portland on 03 5525 0900 or visit them at 23- 25 Kunara Cresent Portland.